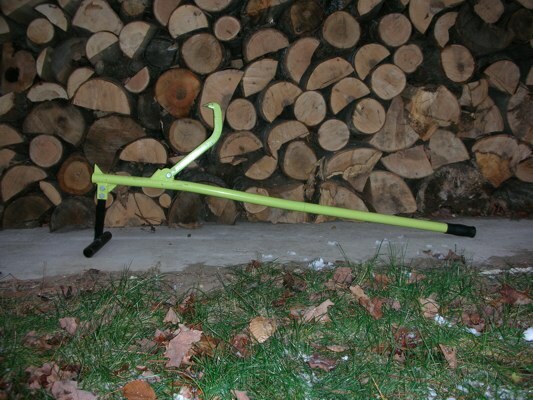 Here it is.....our Timber Tuff timberjack review. One of the easiest, most cost effective ways I've found to obtain firewood is by purchasing 8 foot logs from a logging company by the "pulp cord." The logs are straight, free of limbs and generally pretty clean. If you spend a little time searching for a good price and have the ability to cut the wood yourself, it can be a lot cheeper than having firewood delivered to your door. I enjoy cutting firewood but I'm always looking for a way to make it easier, quicker or safer.....so I decided to purchase a timberjack. 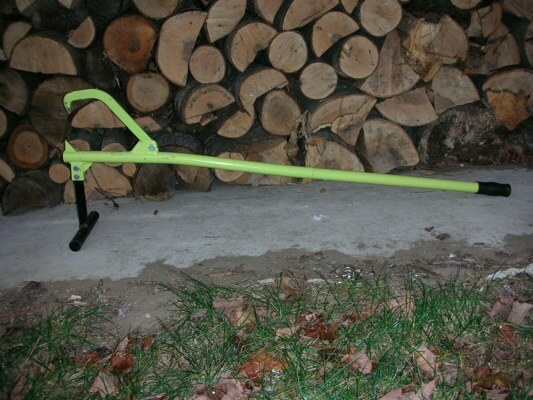 A timberjack is a tool used to raise a log off the ground to prevent your chainsaw from cutting into the dirt under the log. By raising the log, you can easily cut entirely through the log without damaging our dulling your chain. I decided to purchase the Timber Tuff TMB-45 steel handle timberjack from Tractor Supply Company, also known as TSC. The cost was reasonable, about $35-$40 and I figured the steel handle would be durable. Overall length 48'' useable handle length 37"
Out of the box the timberjack felt solid. I screwed the 2 piece handle together, assembled the other parts and took it out for a test. My thoughts.......not too bad! Then on about the 3rd or 4th time using the tool I tried to lift a red pine. The tree was not huge and I thought it was within the 12" diameter recommended for the product. When I attempted to raise the log the steel handle bent. I immediately stopped prying on the log so the amount of bend in the handle was minimal. Even though the bend was small, I was a little disappointed the steel handle bent so easily. Now, I find I leave the timberjack in my barn more often than not. Although the tool can be useful, I find it's easier to just cut 3/4 of the way through the log, roll it over and finish the cut. - Lifts logs off the ground to prevent chain damage. - Gives you leverage to roll logs much easier. - Powder coat paint finish is durable and resists rust. - Bright green finish makes it easy to find in the woods. - Bent after a few uses. - After you raise the logs they seem to move and roll a little bit on top of the timberjack. I would like them to feel a little more secure. - Sometimes it's hard to get the timberjack to "bite" into the log to roll it or raise it. The jaws tend to slip off a lot. Some users have sharpened the spike to help it bite better and have reported better performance. Overall, I would say the Timber Tuff TMB-45 steel handle timberjack is just okay. There are times where the tool is useful and it's nice to have. However, for the majority of the time cutting the logs 3/4 through, rolling them and finishing the cut is easier. Here's one nice feature about the tool. Taking off the stand allows you to use the timberjack to roll the logs which is sometimes easier than rolling them by hand.